The term office politics is usually considered a derogatory one and many would advise you to stay away from it and take a neutral stance, especially since being involved in this negativity might affect your performance and make coming to office a hellish experience. Steering away from politics might be easier said than done especially when avoiding it might negatively affect you more. Here are some of the ways in which staying away from office politics might not necessarily be a good thing for you to do. 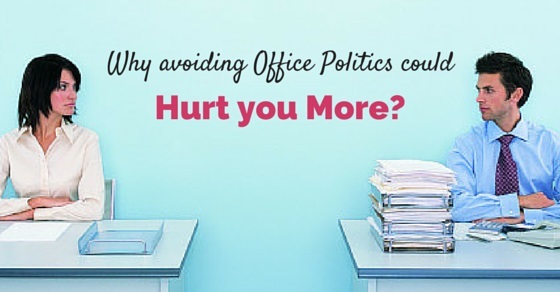 Why Avoiding Office Politics Could Hurt You More? Being neutral in the work place might not be as effective as some might think it to be. When you go to work thinking, you are going to make it a point to talk to everyone you end up not making any real associations as no one will be able to properly place their trust in you. They might think that since you are friends with everyone you might just go around spreading gossip and news from one group to another. In any event you should try never to be this sort of person, as once you do so you might lose the trust of your colleagues and even that of your seniors. Trust once lost can hardly ever be won back again. Working in an office becomes especially complicated when you are unable to forge a meaningful relationship with anyone who is working with you. Being involved in office politics and belonging to a group implies that you will always be in the loop about important information which is being circulated. This does not mean that the various groups will deliberately leave you out, it simply means that they will tell all their close friends and they might assume that you will get your information from another source. Very often, office politics is not merely all about being in different groups and disliking anyone who does not belong to your group. The reasons are often much more deep seated; they can even be ideological in nature. Sometimes when you do decide to take part in office politics it shows that you too are capable of taking a stand and that you are brave enough to stand by what you believe in. Office politics is not always a negative thing, when this politics is healthy then even when one party hates the next; this hatred is purely professional and not personal. So even if people disagree with your point of view, yet they will respect you for at least having one. People who are actively involved in office politics are most often seen as those who have considerable hunger for power as well as leadership qualities. You might think that seniors are unaware of the politics that goes on between colleagues but you can be rest assured that they are aware and if they notice that one individual is able to wield a lot of power by influencing a great deal of people they will obviously think of that person as one with a powerful personality and leadership skills, so they obviously choose him or her if an occasion for a promotion comes along. Both separate individuals and different groups may engage in work place politics and being a part of either or both might not always be a bad thing especially because it will show you as someone who has a voice and is not aloof or disengaged from the happenings of the office. Your boss will almost certainly think that only a person who is really engrossed in the happenings of the office will truly care enough to engage in the politics. Very often this might not be the case, as you might be too busy immersed in actual work to participate in politics, but bosses often fail to see things from that perspective. Healthy work politics ensures that there is going to be a fair bit of competition either between two or more different people or groups. As long as things do not get out of hand and you do not over work yourself, a certain amount of competition will surely serve as a challenge that will bring out the best in you. If you are not one to participate in politics then you will not have that drive to work harder and increase your performance. A little pressure is good to push you to the extreme . So how could it hurt to participate in office politics when it yields better outcomes, helps you put your best foot forward as well as not compromise with any aspect of your work output? People who sit on the fence and choose not to voice what they are thinking and feeling are considered by many to be dangerous and even lethal personalities, since no one can really tell what they are thinking. Those loud and bold ones who speak what’s on their mind aren’t as feared because colleagues can tell where they stand when it comes to their relationship with those people. Even if you are not one to be sly or cunning, you could be giving people the wrong impression about yourself. When you participate in politics people are aware of what you believe in so they will not distrust or avoid you. Keeping aside all the healthy competition or ideological differences in the work place when you start to participate in work place politics you automatically end up making some new friends. It is important to have some good friends in your work place that will be there for you when you are ill or will have your back and share responsibilities when things go wrong. Keeping to yourself and distancing yourself from politics might end up making your feel isolated because in most cases almost everyone in any office, to some degree or the other is involved in work place politics and staying away from it might come at the risk of you not being able to have a good rapport with anyone. Once you make a few friends at work, you automatically end up having a good time but you should ensure that it does not happen at the cost of you submitting substandard work. When you decide to participate in work place politics, eventually meet a few like minded people, this could really work in your favor as you could discuss your work place woes or views with these individual. When you choose to vent to your family or friends, it might be a futile exercise as they could not possibly understand what you are going through, when you take out time to discuss work place issues with people you actually work with, then only will you know whether it’s just you or other people too feel the same way about a given issue. Talking or sharing feelings can really help relieve a great deal of stress and tension. Once you have given vent to your emotions and come to learn that others share your opinion, then you must know that this isn’t merely a figment of your imagination. When an entire group is in consonance with what you have to say then all of you can join forces and communicate your thoughts to the higher authorities. Work place politics is a positive thing when it helps bring about much needed change and even revolution. Now wouldn’t you want to be a part of that group that is able to bring about a positive change in the work place? Healthy work place politics can be a lot of fun, especially when people are mature enough to remember that it is all professional and nothing personal. No one should make any personal remarks that could hurt someone’s feelings or sentiments. When everyone remains within their limits then things become fun and enjoyable. So these were some of the ways in which not participating in work place politics might adversely affect you. It is only when this political landscape gets out of hands and people start manipulating others for personal gains that things truly get ugly. So do not shy from indulging in a little office politics as long as it doesn’t take a negative toll on you or your work.